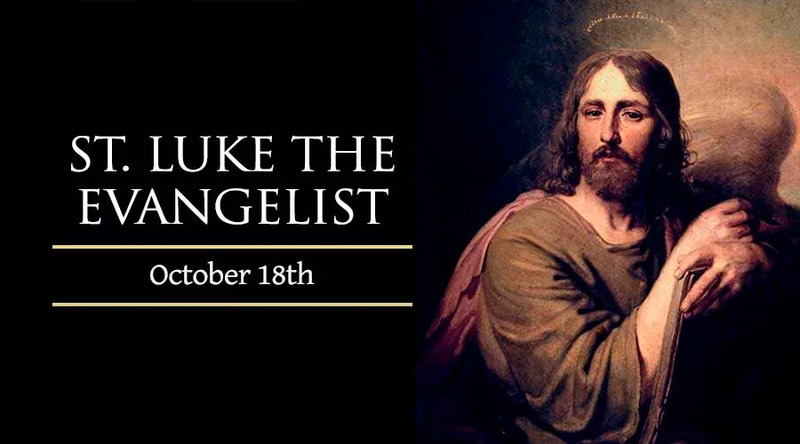 On October 18, Catholics and other Christians around the world will celebrate the feast of St. Luke, the physician and companion of St. Paul whose gospel preserved the most extensive biography of Jesus Christ. St. Luke wrote a greater volume of the New Testament than any other single author, including the earliest history of the Church. Ancient traditions also acknowledge Luke as the founder of Christian iconography, making him a patron of artists as well as doctors and other medical caregivers. Luke came from the large metropolitan city of Antioch, a part of modern-day Turkey. In Luke's lifetime, his native city emerged as an important center of early Christianity. During the future saint's early years, the city's port had already become a cultural center, renowned for arts and sciences. Historians do not know whether Luke came to Christianity from Judaism or paganism, although there are strong suggestions that Luke was a gentile convert. Educated as a physician in the Greek-speaking city, Luke was among the most cultured and cosmopolitan members of the early Church. Scholars of archeology and ancient literature have ranked him among the top historians of his time period, besides noting the outstanding Greek prose style and technical accuracy of his accounts of Christ's life and the apostles' missionary journeys. Other students of biblical history adduce from Luke's writings that he was the only evangelist to incorporate the personal testimony of the Blessed Virgin Mary, whose role in Christ's life emerges most clearly in his gospel. Tradition credits him with painting several icons of Christ's mother, and one of the sacred portraits ascribed to him – known by the title “Salvation of the Roman People”-- survives to this day in the Basilica of St. Mary Major. Some traditions hold that Luke became a direct disciple of Jesus before his ascension, while others hold that he became a believer only afterward. After St. Paul's conversion, Luke accompanied him as his personal physician-- and, in effect, as a kind of biographer, since the journeys of Paul on which Luke accompanied him occupy a large portion of the Acts of the Apostles. Luke probably wrote this text, the final narrative portion of the New Testament, in the city of Rome where the account ends. Luke was also among the only companions of Paul who did not abandon him during his final imprisonment and death in Rome. After the martyrdom of St. Paul in the year 67, St. Luke is said to have preached elsewhere throughout the Mediterranean, and possibly died as a martyr. However, even tradition is unclear on this point. Fittingly, the evangelist whose travels and erudition could have filled volumes, wrote just enough to proclaim the gospel and apostolic preaching to the world. Patronage: artists, bachelors, bookbinders, brewers, butchers, doctors, glass makers, glassworkers, gold workers, goldsmiths, lacemakers, lace workers, notaries, painters, physicians, sculptors, stained glass workers, surgeons.